The Order of Friars Minor, founded by St. Francis of Assisi, is a fraternity. 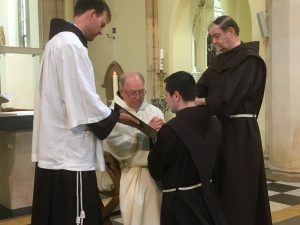 In this fraternity the friars follow Jesus Christ more closely under the inspiration of the Holy Spirit; through profession they dedicate themselves totally to God whom they love above all, living the Gospel in the Church according to the form observed and proposed by St. Francis. The friars, as followers of St. Francis, are bound to lead a radically evangelical life, namely: to live in a spirit of prayer and devotion and in fraternal fellowship; they are to offer a witness of penance and minority; and, in charity towards all humankind, they are to announce the Gospel throughout the world and to preach reconciliation, peace and justice by their deeds; and to show respect for creation. God bless you as you continue on your discernment journey.